The weaving may be complete, but the Lady and Unicorn tapestry is not ready for the wall. 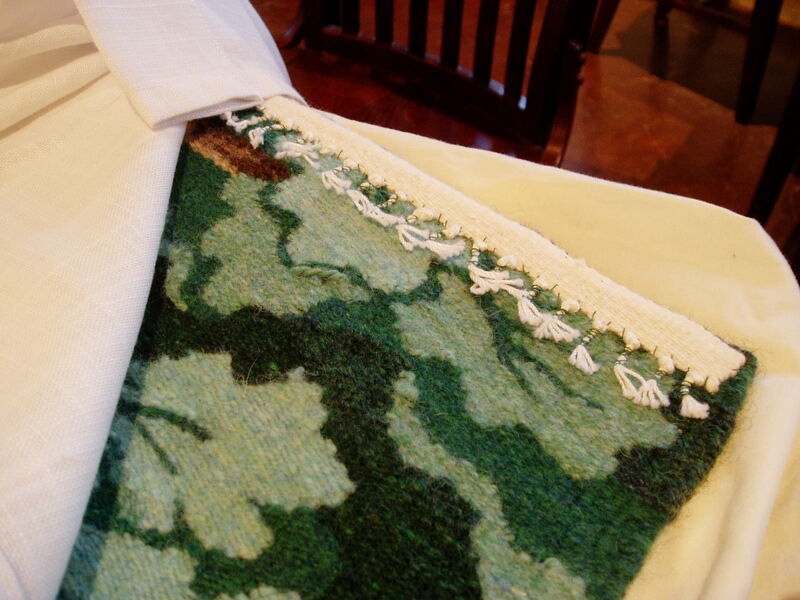 Unlike Navajo weaving where, once off the loom, only the corner tassels need tying and it’s ready to go, Flemish style tapestry (including techniques from the medieval period) utilize “slit weaving,” which allows the weaver to focus on a particular part of the tapestry (unlike Navajo, which works the entire width each row). This “slit weaving” method, I have found, makes a crucial difference in my ability to focus on a highly complex portion of the textile image at a time, rather than trying to remember my shading and dynamic intent across the whole of the piece at once. The trouble with slit weaving is that, when released from the tension of the loom, you can often stick your finger between the colors! This does not make the piece durable or able to hold its own weight when hung. 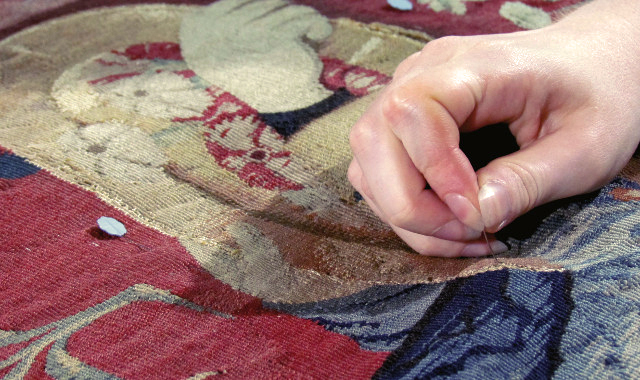 This is especially true for Flemish style tapestries that, like “Deceiving the Hunters,” are woven on their side. When mounted, the weft threads rather than the warp bear the weight. So what to do with all those slits? 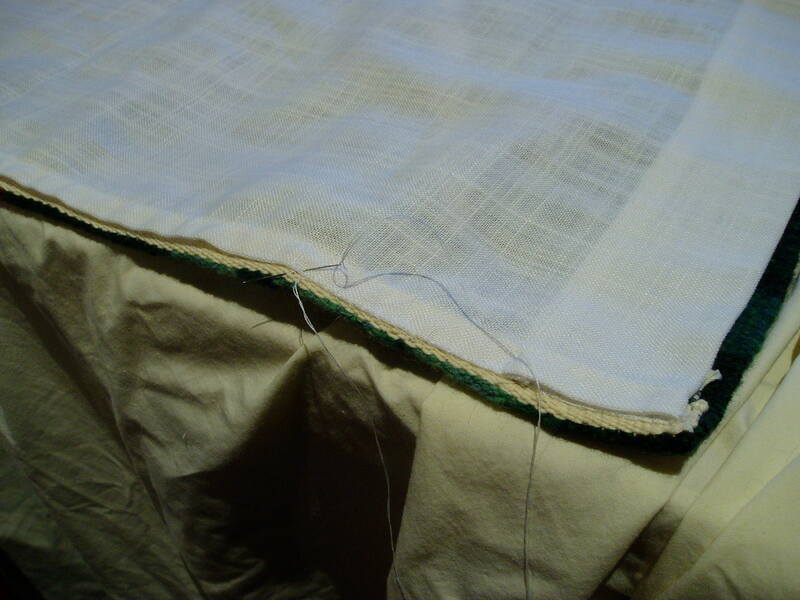 Working on the back of the piece, they have to be carefully hand stitched together using threads that match the colors of the slits being worked. The goal is to create structure and rigidity but remain invisible, so that only the weaving shows on the front, not the stitching. In Navajo textiles, the rule is that the special “interlock” method that allows these tapestries to come off the loom with no need for stitching is used whenever two colors touch for four or more row ends (eight rows). So when stitching my Flemish tapestries, I follow this rule and stitch together any slits four or more loops high. In a piece as complicated as “Deceiving the Hunters,” this was hundreds and hundreds of places! From stabilizing the lady’s eyes to around every leaf to the strands in the unicorn’s mane and everywhere else, the task was considerably daunting. In some places, the work had become so fine, the weaving involved wrapping the weft around a single warp for many rows. To stabilize these parts, I would catch the loop on one side, go through the wrapped warp, then catch the loop on the other side and come back. With one hand underneath the piece to feel if the needle was coming through and the other stitching away, endless hours of attention to detail ensued. But the resulting strength, rigidity, and durability to the piece is certainly worth the effort! After a careful steaming and securing the warp ends (as shown left), I stitched on the freshwater pearls carefully saved to adorn the lady’s headdress and sleeve cuffs. 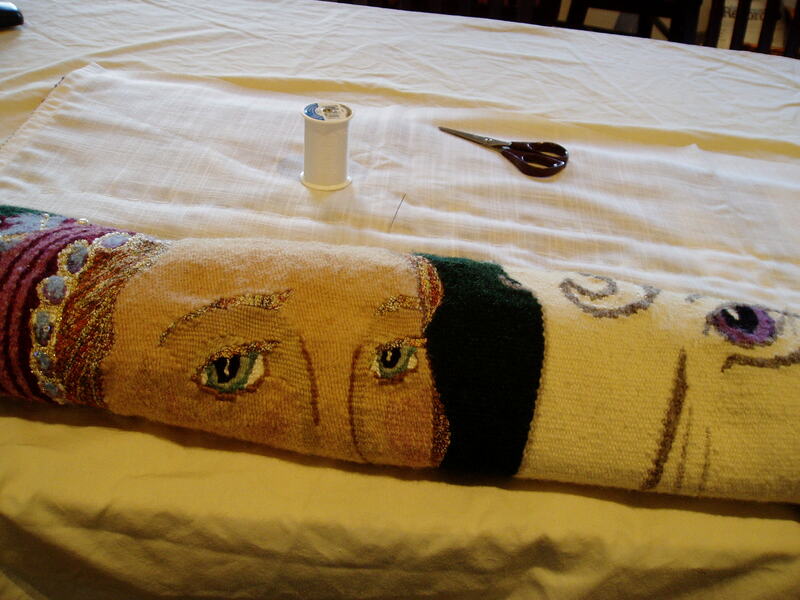 Now it was time to add the backing to the tapestry. It is not traditional in Navajo tapestry to sew on a backing, since these were originally designed to be worn as blankets, but I had read that medieval tapestries were given a linen backing and saw that other contemporary tapestry artists were still using this technique. It helps to also disperse the weight of the piece and protect the back from moths that would attack the wool. 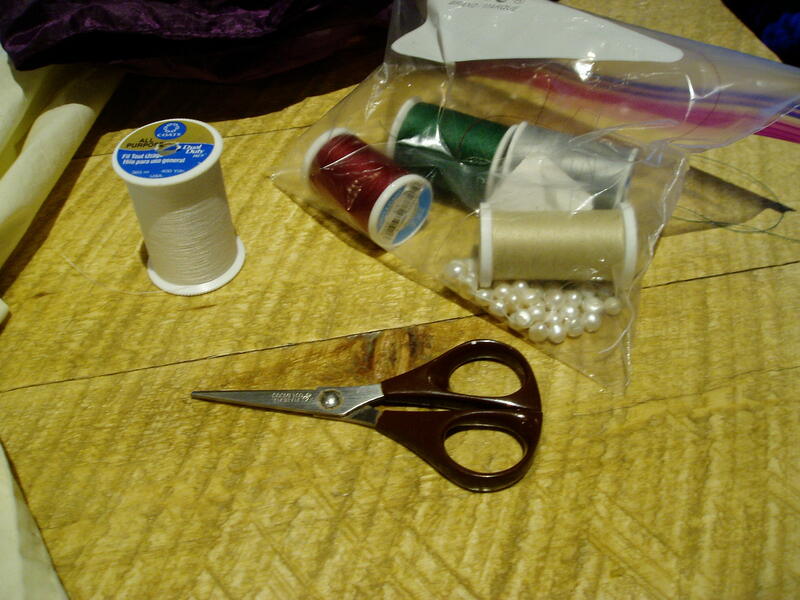 Using a quilting “running stitch,” the backing is basted onto the piece every two inches to keep it from “pillowing” out and act as a single textile. A pocket at the top holds the wood slat that allows the tapestry to be hung evenly upon the wall. Stitching, stitching, stitching away… I had a dent in my right middle finger for a week from pushing the needle through! Who knows how many yards of thread the process required. But as the last seam was complete and the eyelets screwed into the mounting wood, finally, finally the tapestry was ready for the wall. It has been a long time coming for that moment when I could stand back and see the piece as a whole, in its rightful orientation (instead of sideways, as it was while weaving) in the way it will be viewed for the rest of its lifetime on this earth. Time for a photo shoot!